Description: Cumaru, commonly called Brazilian Chestnut, is a tough and dense wood imported from Brazil that has an irregular, somewhat interlocked grain and wavy, course texture. Because of its density, it is very resistant to termites and decay. Cumaru's heartwood is a medium brown with distinctive tan shades that compliment one another in with tonal warmth to create a relaxing feeling that's great to come home to. Color: Reddish-brown or purplish-brown when fresh, shifting to light-brown to yellowish-brown upon exposure. 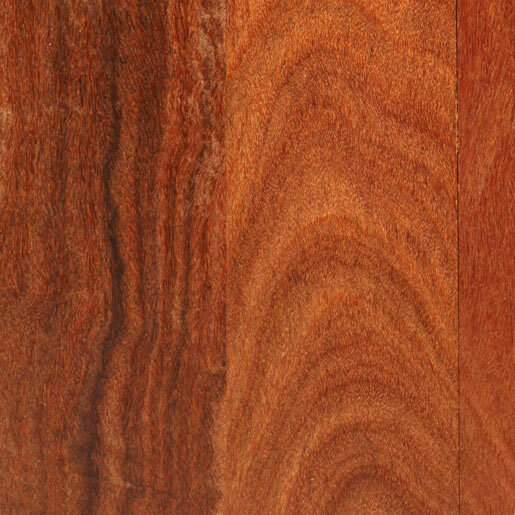 Sapwood is yellowish-brown. Tree Characteristics: The Cumaru tree can reach 160 feet in height with trunk diameters up just over 3 feet. Geographic Area: Venezuela, Colombia, Brazil, Peru, Bolivia, The Guianas. Durability Rating: Rated as very durable, resistant to brown and white-rot fungi, and has exemplary weathering characteristics. Drying Characteristics: Rated as easy to air season, can sometimes check and warp, uniformly rapid drying. Working Characteristics: Rated as difficult to saw or bore. Poor for gluing due to high density and oily nature. Applications: Cogs, flooring, decking, turnery, bearings, tool handles, railroad crossties, heavy construction.